This post is for those that profess to be Christian (as I do not expect this from the unsaved world). But what is this graphic missing? Is this graphic a portrait of today’s unbiblical Christendom? The first sentence in this graphic is a good start, to individually recognize and confess our sins thru Christ. But this prayer on an individual and/or national level is missing an important Biblical response – which is REPENTANCE (which God grants to those whom He saves). As there is no individual salvation without repentance. Repentance is not ‘the cause’ of salvation, repentance is ‘because’ of salvation. 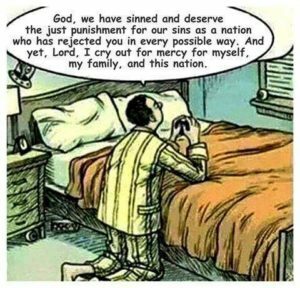 Though an individual Christian must repent, but has our nation at-large repented for her national sins? The answer is of course not. Therefore perhaps the second sentence in this graphic is an unreasonable request. Our ungodly nation at-large has defiantly waved their fists at God. All the way to the highest levels of legislative jurisprudence, our nation has approved, committed, and legislated the following crimes and transgressions against God (including but not limited to). Therefore as a born-again Christian (a bond-slave to Christ), in faith, we must understand that America does not deserve Gods grace (getting what we don’t deserve), nor His mercy (not getting what we do deserve). On the contrary, what America does deserve, is Gods Divine judgement, and Holy wrath, and nothing less (and yes it is coming). Moreover, let us never accept, congratulate, celebrate, nor acquiesce to the sins of those whom do commit the aforementioned sins. And all the CHRISTians said? Amen! As always – Ye must be born again. Christians love ‘biblically’ – repent – be salt and light – be holy – be sanctified – fear God – pray without ceasing – keep His commandments – walk circumspectly – believe in and trust Jesus – obey the Gospel – share the Gospel – preach the Gospel – contend for the faith, – hate the things that God hates, and love the things that God loves – fight the good fight – convince, rebuke, exhort – keep the faith, work-out your salvation, rejoice, and endure to the end! President Obama disgraced America when he went to other Countries apologizing for America. But now I am apologizing to other countrymen, but for my American President – Donald Trump. As you know two days ago in a Senate meeting President Trump referred to Haiti and African nations as “shithole” countries (forgive me for quoting his word). The sinful pride and arrogance of Trump perhaps might become the further demise of America. As a Christian man that happened to be born in America, I can no longer be ‘proud’ of my Nation. Why? Because as I stated in this blog post, “All the way to the highest levels of legislative jurisprudence, our nation has approved, committed, and legislated” multiple crimes and transgressions against a Holy God. Mr. Trump a couple of the most Godliest Facebook friends that I have, happen to live in the African continent, you should learn from them. Mr. Trump I must give some credit where it is due. You have accomplished some good thus far, and I am thankful for that. But your pride and arrogance is one of the reasons why I did NOT vote for you – God hates it. Once upon a time I too was very proud of my country, but then I repented, and became more concerned about the state of the Lord’s Church, than I am my own Nation. It is the Church (Christ’s bride) that Christ died for, it is His bride that I will spend my eternity with. Lastly, Mr. Trump, many Christians are praying for your salvation, that you will repent and humble yourself before a Mighty God (the God of the Scriptures).